The economic impact of USMCA on Mexican-US trade is likely to be limited, as it is effectively a small modification of the pre-existing NAFTA agreement. Andrés Manuel López Obrador of the left-wing Morena party won the July 2018 presidential elections with over 50% of the popular vote. He will govern with a strong political mandate, as a Morena-led coalition also gained a majority in both houses of Congress in the parliamentary elections. A main reason for López Obrador´s landslide victory was his promise to decisively combat crime, corruption and poverty. Ahead of the election the credibility of the political establishment severely suffered from public discontent over institutional defects, several major corruption and security scandals and the persistently high crime rate. More needs to be done to tackle the poor domestic security linked to drug-related violence and rampant corruption, which severely affect the business climate and hamper economic performance by discouraging investment. For a solid recovery of the country’s medium-term earnings capacity, Mexico would need to improve its law enforcement, the independence of the judiciary system and to overhaul police institutions. While Mexico’s economy is generally diversified, it remains closely synchronized with the US business cycle. The US accounts for 80% of exports (more than 25% of Mexican GDP) and is the main source of remittances (2% of GDP). Mexico´s dependence on oil revenues has decreased, but is still significant (7% of goods exports, 8% of GDP and 20% of government revenues). The Mexican peso is vulnerable to shifts in market sentiment, due to a high stock of inward portfolio investments (more than 250% of official reserves) and the fact that it is the most traded emerging market currency. With the signing of the USMCA agreement, short-term uncertainty over North American trade has decreased. Overall, the economic impact of USMCA on Mexican-US trade is likely to be limited, as it is effectively a small modification of the pre-existing NAFTA agreement. However, US steel and aluminium tariffs imposed on Mexico remain in place for the time being, and longer-term uncertainties still linger. USMCA still has to be ratified by the national parliaments of its three members. Concerns about President López Obrador´s economic policy direction and the enforcement of contracts have increased, especially after the decision to cancel Mexico City’s new airport plans after a (controversial) public opinion poll - despite the fact that one-third has already been built and nearly 70% of the project is already financed. The new president also announced to suspend oil auctions for three years, slowing down the landmark energy reforms made by his predecessor Peña Nieto. The 2019 budget plan introduced in December 2018 dispelled doubts about the new government´s commitment to financial stability, at least for the time being. 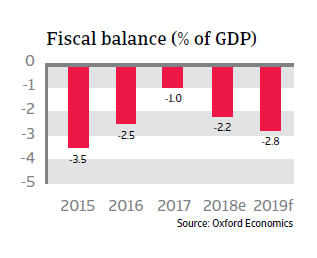 While the President Lopéz Obrador´s plan includes more spending on social programs and infrastructure, it is still preserving the prudent fiscal framework established by his predecessors. 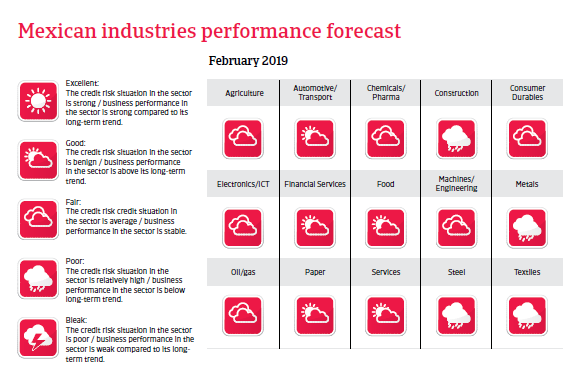 However, it remains to be seen if the government will stick to its commitments in 2019, especially if revenues are lower than expected (in case of lower than forecast economic growth and dropping oil prices). The government debt structure is generally favourable (67% in local currency). The main vulnerability is a relatively high share of debt held by non-residents (50%), but refinancing risks are mitigated by a favourable maturity structure (average maturity of more than ten years) and prudent debt management. The vulnerability to oil price declines has been mitigated by fiscal reform and an oil price hedge. The financial situation at Pemex has stabilised, which has mitigated the risk of contingent liabilities. However, uncertainty has increased over the future of the Pemex consolidation process under the new administration. Since 1994, average annual real GDP growth was just 2.6%, mainly due to low investments and weak productivity. 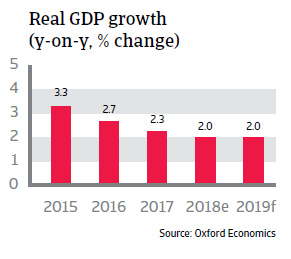 While uncertainty about the future trade relationship with the US has eased, economic policy uncertainty has increased, which could further dampen investments in 2019. 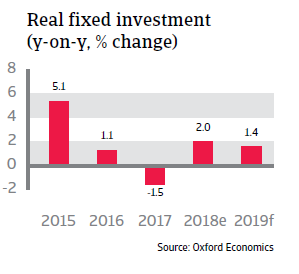 While in 2018 stable private consumption and accelerating exports compensated for lower investments, this might not be the case in 2019. Consumer confidence has decreased, which is expected to weigh negatively on consumption growth going forward. 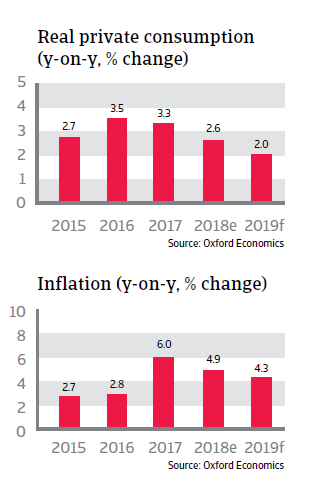 Inflation has eased, following interest rate hikes, and should return to the Central Bank´s target band of 2%-4% this year. Concerns over the policies of the new administration and the ongoing normalisation of US monetary policy are weighing on the currency, with the peso exchange rate expected to remain volatile in 2019. Despite the ongoing political and economic uncertainties, Mexico seems to be quite resilient in dealing with them due to strong economic fundamentals. Any steep deterioration of the economy seems to be rather unlikely. Exchange rate fluctuations serve as a shock absorber for the economy, helped by the fact that Mexico´s foreign currency debt held by the public and private sector remains limited. The (mainly foreign-owned) banking system is profitable, well regulated, supervised and capitalised. Non-performing loans are stable at 2.1% and fully provisioned, while dollarization (13%) and reliance on foreign funding are low, reducing exposure to external shocks. Both government debt and external debt are sustainable, with the latter having stabilised around a relatively low 40% of GDP (45% owed by the sovereign). The debt service ratio remains low, which also reflects a lengthening of maturities by both the government and corporation. 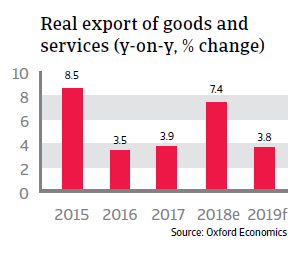 Current account imbalances remain modest; however, the coverage of the current account deficit by foreign direct investment is expected to decrease to 80% in 2019, from over 100% previously. The international liquidity position is adequate with abundant official reserves (more than four months of imports, abundant to cover 2019 external refinancing needs). There is additional liquidity potential from a precautionary IMF credit line of USD 74 billion (until November 2019), on which Mexico can draw in times of adverse global credit conditions. This reduces transfer and convertibility risks. Access to capital markets is still solid, which is reflected in several international bond issues in 2018 by the sovereign and the private sector, including Pemex. However, financing costs are rising, as spreads vis-a-vis US Treasuries have substantially increased since end of last year.